Sedans aren’t doing too hot right now, with crossovers and SUVs blocking them from buyers’ sight lines like a tall kid who thinks they belong on the front row of the class photo. Now that Cadillac’s filled out its lineup with more people-movers like the XT4 and XT6, it’s ready to try again with sedans. 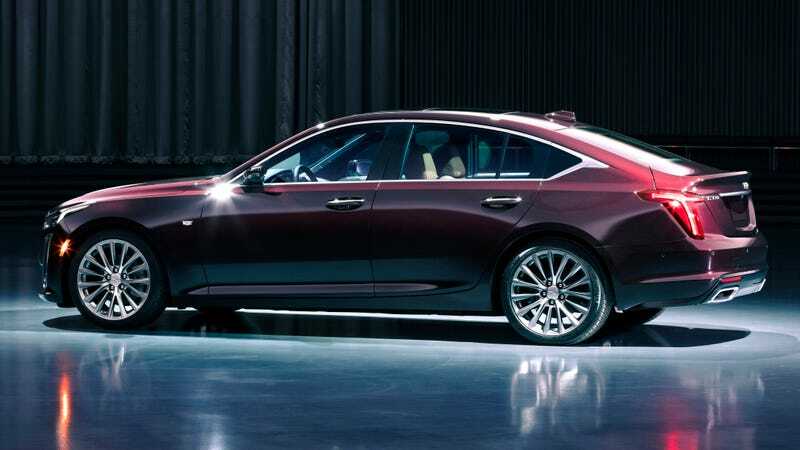 Here’s more info on the new 2020 Cadillac CT5, and how it’s different from the CTS (and ATS) it replaces. The CT5 makes its official debut at the New York Auto Show this week and we know a little more about it now. First, there are fewer engine options than before. The new sedan will come with either a 2.0-liter turbo four or a twin-turbo 3.0-liter V6 engine, good for 237 or 335 horsepower, depending on what your heart desires—or what your wallet allows it to. All of the cars come with a 10-speed automatic transmission, and will send power to the rear wheels unless a buyer pays for the optional all-wheel drive. It comes in three flavors: Luxury, Sport and Premium Luxury. The V6 can be had on the last two. The Cadillac CT5 Premium Luxury trim. What we do know is that it replaces both the mid-size CTS and the smaller, 3 Series-fighting ATS in Cadillac’s lineup. Size-wise, it’s sort of between the two: it has a two-inch longer wheelbase than the CTS but is almost three inches shorter overall. It’s also two inches wider than the CTS but the exact same height. In the Luxury rear-wheel drive trim, with the four-cylinder engine, the CT5 is 3,660 pounds to a similar CTS’ 3,714. As far as standard technology and safety features go, the new sedan will get an infotainment screen that measures 10 inches diagonally, remote start, forward collision alert, front pedestrian braking, General Motors’ low-speed forward automatic emergency braking, and a driver’s seat that’ll buzz if the car detects the risk of a crash. Anyone who wants to pay extra can have more safety tech, massaging front seats, and Cadillac’s Autopilot-rivaling Super Cruise tech. This is the first car to get Super Cruise beyond the CT6 flagship sedan. The CT5 Premium Luxury trim. The announcement said the CT5 will be available to order in the fall, but don’t start budgeting yet—pricing and other information isn’t out yet, and won’t be until closer to the start of production. Perhaps when that time comes, the new CT5 will be able to steal some of the attention from those irresistible crossovers and SUVs. Or perhaps it won’t, because no one really wants to be the one to push the tall kid out of the way.